Joy Covey helped catapult Amazon.com from a small company to the global powerhouse it is today. Earlier this year, on a bicycle ride in San Mateo County, Calif., she was struck by a delivery van and killed. She was 50 years old. Joy is one of hundreds of men and women killed while bicycling or walking on our streets each year. This has to change — and a one-sentence bill in Congress could do it. Please contact your members of Congress today to ask them to co-sponsor H.R. 3494 / S. 1708, which requires the US Department of Transportation (USDOT) and state DOTs to account for and work to reduce bicyclist and pedestrian deaths. Take Action Here. Last week, the National Highway Traffic Safety Administration (NHTSA) confirmed that biking and walking fatalities have continued to increase – now representing 16.3 percent of all traffic deaths and a total of 5,469 people killed. Last year, Congress mandated the US DOT to set performance goals, including safety goals. We believe that those goals should include a plan to make biking safer. However, the US DOT has refused to set a safety goal for non-motorized transportation. Congress doesn’t agree: Members of the House and Senate, from both sides of the aisle, have introduced identical bills specifically requiring US DOT to set a goal to reduce the deaths of those biking and walking. The Bicycle and Pedestrian Safety Act states clearly that the lives of all roadway users are important — and creates accountability toward ending needless deaths. It gives US DOT the flexibility to determine the best method to meet these safety measures, and calls on our leaders to reduce the number of people biking and walking who are killed or injured on our streets every year. It’s time that we all stand together to say that the deaths of bicyclists and pedestrians deserve to be counted and prevented, too. Please help us build the momentum for this important legislation by contacting your members of Congress to ask them to co-sponsor these bipartisan bills. 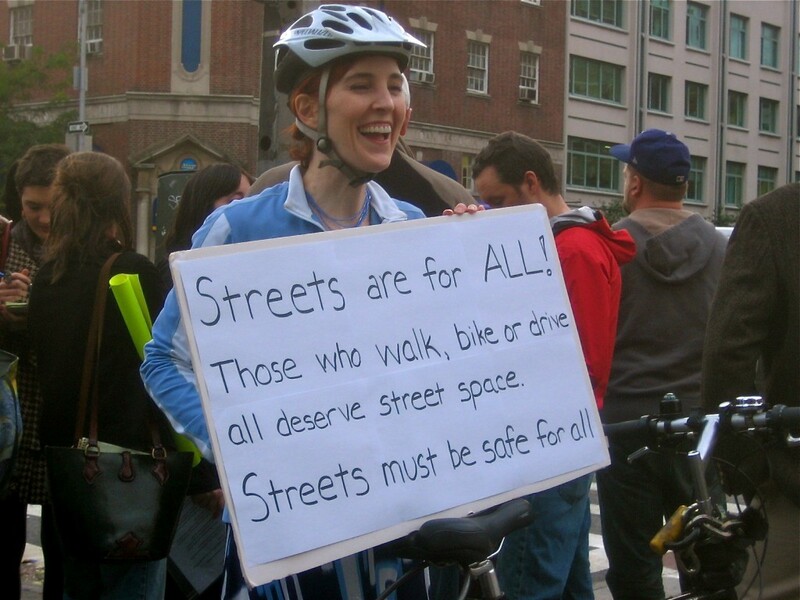 Without it, people who bike and walk, like Joy, will remain in the blindspot of our transportation system. Join this effort, and tell your lawmakers to vote for these straightforward, bi-partisan bills. Take action. We haven’t asked for major help in a long time, but next Tuesday it is essential that we have a significant presence at the Provo City Council meeting. 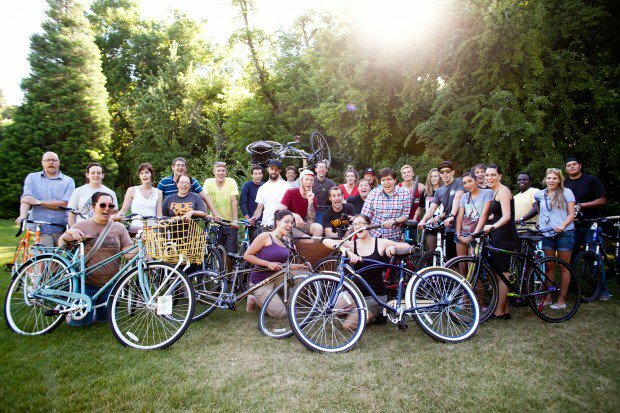 If you support a bicycle and pedestrian friendly city, we need your help! Now is the time to stand up and make a difference! We are concerned about delays in the passage of the Provo Bicycle Plan (currently held up in committee and over a year past the anticipated adoption date). We also believe it is unreasonable to ask Provo residents to pay a “transportation fee” that doesn’t give consideration to all forms of transportation on our public roads. Residents will be required to pay the fee that is being discussed at Tuesday’s Provo City Council Meeting, yet the entire discussion about this fee to fund maintenance of public roads has only focused on automobiles. Pass the Provo Bicycle Plan as quickly as possible and pass the plan in tact without watering it down or applying unreasonable standards that are not applied to similar general plans. Allocate 2% of the transportation fee funds to bicycle projects (the current mode share for bicyclists in Provo is 2.38%). Adding this to the proposed fee schedule would equal six cents a residence. We want to have a friendly, cordial presence while showing that this is a quality of life issue that the residents of Provo care deeply about and are not giving up on. WE NEED YOU! Please bring your friends, family, and kids and feel free to drop by even if you can only stay for a short period. Signs are particularly appreciated. Here are a few idea, but feel free to let your creative juices flow! Following the rally, we invite you to stay for the city council meeting and express your desire for a bicycle / pedestrian friendly Provo to your local elected officials during the public comment period (each speaker is allowed two minutes to speak). The weather forecast for Tuesday is low 50s and clear. Hot cocoa will be provided! Take a look at the Facebook Event. By now, you’ve probably heard a lot about the Provo Bicycle Plan – a document developed over the last two years that has still not been passed. If you have questions, we have answers. What is the Provo Bicycle Plan? The Provo Bicycle Plan is a document that identifies ways the city can design complete streets; connect our existing segment of bicycle lanes; and create a safer community for bicyclists, pedestrians, and drivers. Most communities that are known for having a high quality of life have already passed similar plans. This 204 page document was carefully crafted by major stakeholders during a two year period. Who created the Provo Bicycle Plan? The Provo Bicycle Plan was created by a steering committee made up of representatives from all major stakeholders: Provo City Engineering, UDOT, UTA, BYU, MAG, Parks and Rec, the Provo Bicycle Committee, the city council, and Alta Planning and Design – one of the top firms in the nation. It was the work of many groups that had not come together before for something like this in Provo. The Provo Bicycle Committee had only a single seat on the steering committee that created the plan. The entities that created it were those that have the power to make things happen and determine whether or not ideas were feasible and fiscally sound. What kind of public outreach was involved with the Provo Bicycle Plan? Extensive public outreach took place over the last two years. Neighborhood outreach for the plan has included: A notice about the plan and avenues for input in the utilities bill sent to every residence. A website created by the consultancy firm just for the plan with a copy of the plan and multiple avenues to provide feedback from home (a feedback form, an email address, etc). A banner across University Ave. and Freedom Blvd. with a URL that led to a website with additional info. Multiple posts on the front page of the Provo city website regarding the plan / meetings. Multiple articles in The Daily Herald, The Deseret News, and The Salt Lake Tribune. A private Provo bike blog with over 400 posts and continual updates on the status of the plan. Multiple highly publicized public meetings with maps / plan overviews and representatives from city engineering, the city council, the administration, the state, and MAG. Opportunities to provide written feedback, discuss the plan with representatives, or give oral feedback to a transcriptionist available throughout the meetings. At the Planning Commission meeting, Casey Serr from engineering noted that the turnout rate at public meetings and the response rate for online surveys was high. Was the bicycle plan rushed? No. The plan was supposed to be completed in less than a year (prior to December 2012). It is now approaching two years and we are missing out on opportunities to compete for funding and complete projects. During this period, there was extensive public outreach, multiple representatives worked to iron out potential issues, and there was considerable education regarding bicycle and pedestrian friendly infrastructure provided to involved parties. During this period, the plan was extensively vetted by Provo engineering, UDOT, UTA, MAG, BYU, etc. 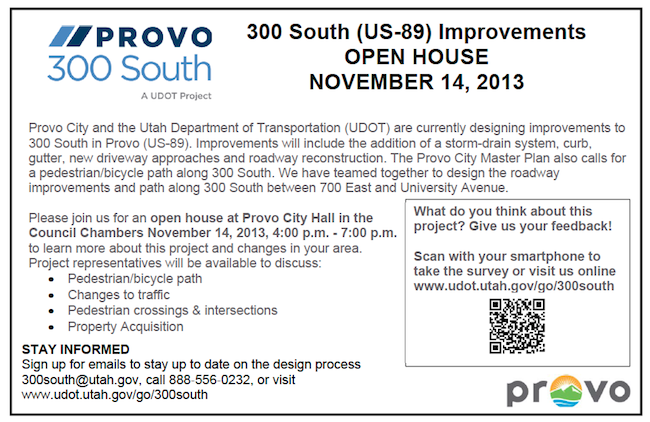 Provo City and UDOT are currently designing improvements to 300 South in Provo (US-89). Improvements will include the addition of a storm-drain system, curb, gutter, new driveway approaches and roadway reconstruction. The Provo City Master Plan also calls for a pedestrian/bicycle path along 300 South. Please join us for an open house in the City’s Council Chambers on Thursday, Nov 14 from 4:00 p.m. – 7:00 p.m. to learn more about this project and changes in your area. 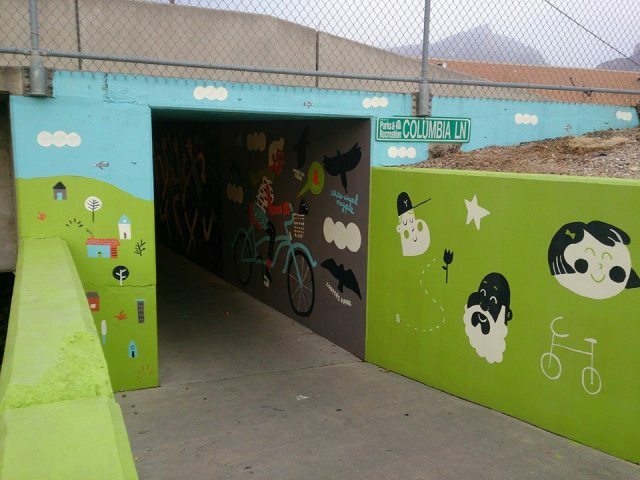 Talented artist Jess Smart Smiley recently finished several incredible murals on tunnels in the Provo River Trail. 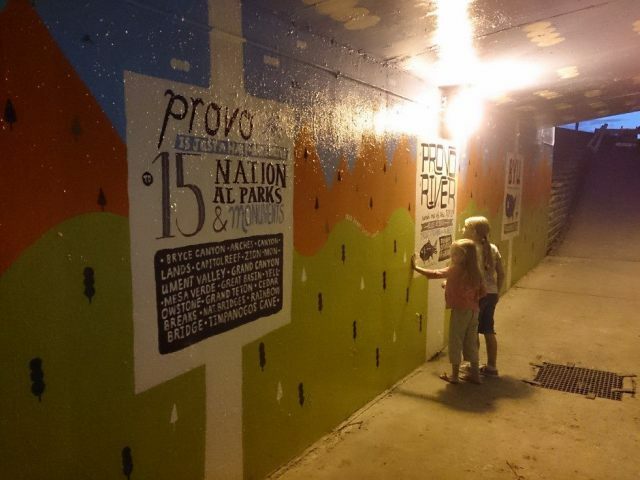 Not only do the paintings do a wonderful job of representing Provo, they also discourage graffiti and are an excellent compliment to the signage added last year by Parks & Rec. You can check out more information and photos on Jess’ website, a post from Mayor Curtis, or this story from KSL. We still have gorgeous fall weather – so take some time out of your week to ride by and check out Jess’ art. Thanks for making Provo a better place to ride!